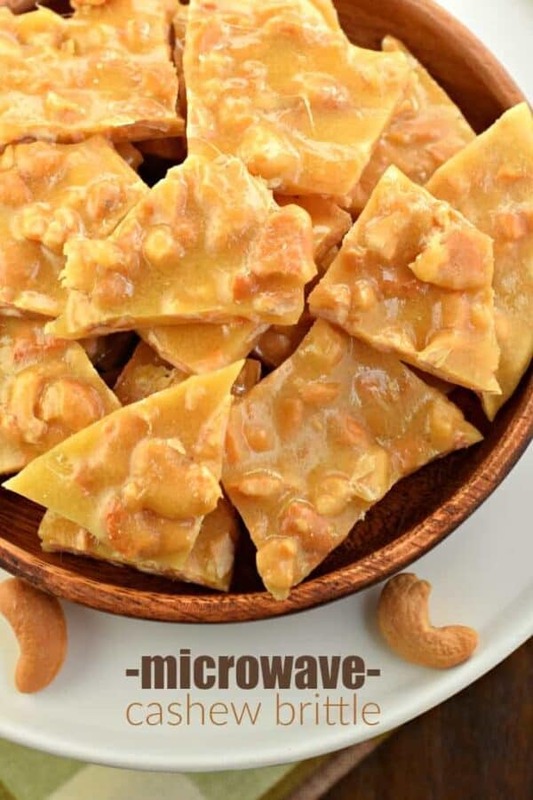 Cashew Brittle made in the microwave! 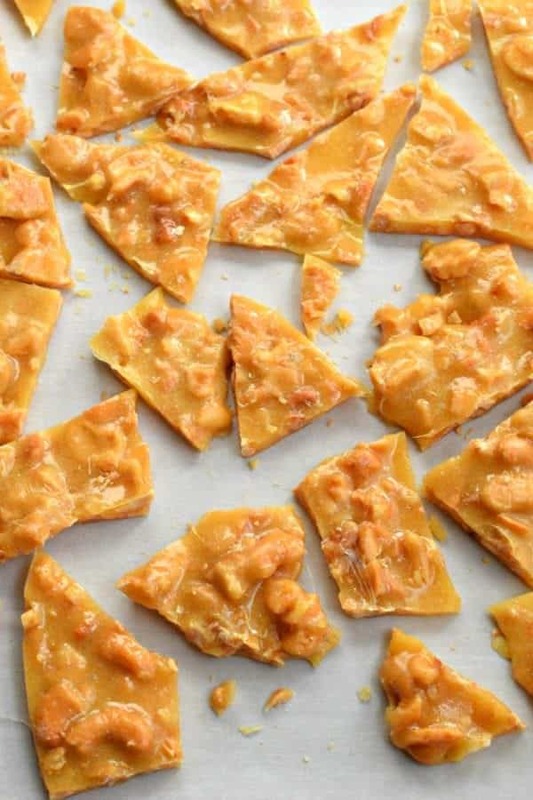 It couldn’t be easier, and it’s a fun twist on the classic peanut brittle. 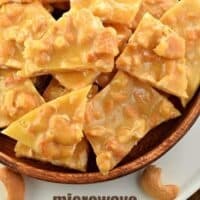 Several years back I made a recipe for Peanut Brittle, in the microwave! 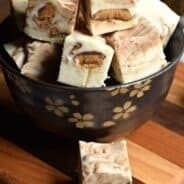 I usually whip up a batch of this easy candy at least once a year. Recently at the grocery store I saw a bag of Cashew Brittle. It got me thinking how easy it would be to take that microwave Peanut Brittle recipe and make a Cashew version. My husband is crazy about cashews. I mean, I love them too, but he could seriously devour an entire bag in a sitting without blinking. That said, I did find a big bag of cashews that I hid in the back of the pantry. Comes in handy when you want to make this cashew brittle or these Toffee Cashew Cookies! My microwave is 1500 watt (full power). Be sure to change your power level by reading the directions below carefully! You’ll want to use a clean, microwave safe bowl when making this recipe. Be careful when removing the bowl from the microwave each time when stirring, this gets VERY HOT. Use hot pads or oven mitts. Have your cookie sheet lined with parchment paper ahead of time. Once you pour the hot mixture onto the parchment paper, use a large knife (or frosting spreader) to smooth out the brittle to desired thickness. I like it to be thin enough that the cashews pop out to create texture! Your bowl will be hard to clean. Sorry about that. Use VERY VERY HOT water to soak it, then use a scraper to crack out the brittle from the bowl. It will come clean, I promise! 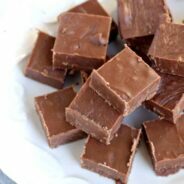 Allow your brittle to sit out and harden at room temperature for about 2 hours. Once it’s hardened, use your hands or a clean kitchen hammer (or meat tenderizer) to break your brittle into pieces. Store in an airtight container for up to a week. ENJOY. Lay a piece of parchment paper over a large cookie sheet. Set aside. Remove and stir in cashews quickly using a rubber spatula or wooden spoon. Return to microwave and heat for 3 ½ minutes (on power level 7). Remove and stir in butter and vanilla extract. Return to microwave for an additional 1 ½ minutes (on power level 7). Remove and stir in baking soda, mixing until light and foamy. Pour over parchment paper and spread to desired thickness, working quickly. Allow cashew brittle to set and harden at room temperature (about 2 hours). Break into desired sized pieces and store in an airtight container for up to one week. ENJOY! I’m like your husband– givemeALLTHECASHEWS!!! It’s the only nut I can eat totally plain (ie, not covered in chocolate). Although I think I’d rather eat them in this brittle! This is a PERFECT treat for my Hubby! He loves brittle and cashews! I am excited to try this microwave version. Cashews are the best!!! I only recently tried cashew butter and its magic! I bet the milder than peanuts flavor of cashews are awesome in a brittle. Yum!! I don’t have the ability to change the cooking power on my old microwave and my first batch ended up a burnt mess! I cut the cooking times in 1/2 and it worked perfectly! Warning: Do not put the hot glass bowl in cold running water – my grandmother’s glass pryrex bowl broke into pieces when I put it in the sink and turned the water on. Lesson learned. That bowl was HOT, as you said it would be! End result: AWESOME Cashew brittle. #burnedbrittlesmellsgross, #brokegrandma’sglassbowl, #2ndtimeisacharm. Made peanut brittle like this for years. Never changed the nuts up! Duh! Thanks for being a genius and sharing!! 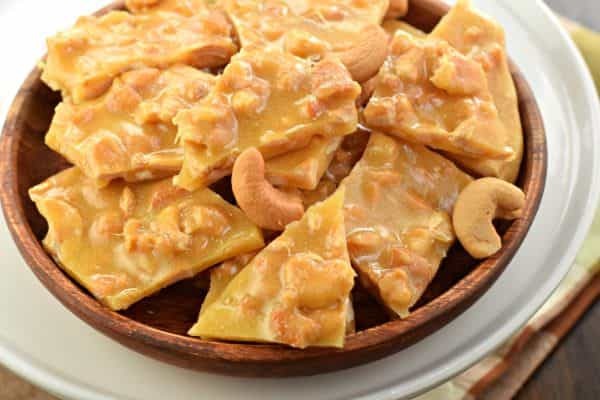 I am obsessed with this cashew brittle! So easy and crazy good! I make this for every holiday! 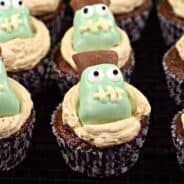 Such an easy sweet recipes! Love the sweetness combined with my favorite nut! I love peanut brittle! Yum! Oh YUM!! Peanut brittle is the BEST!! I don’t have a 1500 watt microwave oven. I truly only use it to re-heat or melt something. It’s only 1000 watts. How would I adjust cooking time and power.